THE TWO PARLIAMENTS -WHAT HAPPENED LAST TIME? At the end of the 2000 elections President Benjamin Mkapa, leader of the ruling party, Chama cha Mapinduzi (CCM) was elected with 71.7% of the vote. Prof. Ibrahim Lipumba, leader of the main opposition party, the Civic United Front (CUF) got 16.3%. Mkapa cannot stand again as he has completed two terms. Prof. Lipumba is standing again, in his third attempt. The 2000 elections were cancelled and then re-run but were subsequently boycotted by the opposition. In the 1995 elections the official margin between the CCM and CUF was only 0.4%. Before that, the last elections held on the islands under a British mandate in 1963 precipitated a revolution. 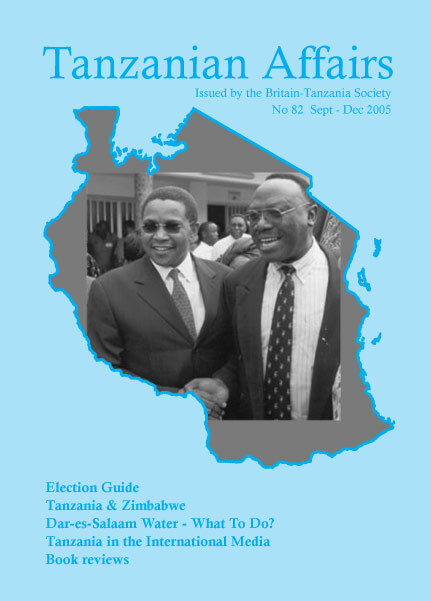 British gerrymandering ensured a victory for the Zanzibar National Party (ZNP) in alliance with another party. Despite forming a government, these twp parties only commanded 46% of the national vote, whereas the Afro-Shirazi Party (ASP) won 54%. The ZNP with its roots among Zanzibar’s elite, left the constitutional monarchy unchanged and the Sultan on his throne. After only a month, the Government and the Sultan were overthrown in the bloody revolution of January 1 1964. 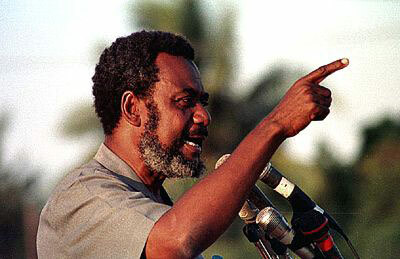 The ‘Revolutionary (now CCM) Government’ of Zanzibar has ruled ever since. Zanzibar’s first President, Abeid Karume, agreed to the establishment of a Union between Zanzibar and the mainland of Tanzania creating the new state called Tanzania in 1964. The second President, Aboud Jumbe, supervised the union between the mainland’s Tanzanian African National Union (TANU) party and the ASP, forming the Chama Cha Mapinduzi (CCM – the Party of the Revolution) in 1977. Some observers see the current political division between CCM and the CUF as nothing more than a reincarnation of the old 1963 divisions. However, although these historical associations undoubtedly have some relevance to older voters, well over half the voters were born since the Revolution and around 45% are under 30. Rawlence goes on: In fact, the current divisions between the two parties are more rooted in events that have taken place since 1964. In the 1963 elections, the ASP won 44% of the vote in the northern island of Pemba but only two seats. At the elections in 2000 and by-elections in Pemba of 2003, CCM’s own official figures put their share of the vote at around 15%. On Unguja island, the south and central regions have remained faithful to CCM but Zanzibar town and parts of the north that were always oriented towards the mainland, have now become either CUF seats or marginal seats. CUF officials claim that of the 32 seats on Unguja, they now have a majority of potential voters in 13. CCM denies this but some CCM officials are said to privately accept the figures. It was after CCM appeared to be losing the supposedly safe CCM seat of Rahaleo in the 2000 elections that police were ordered to seize ballot boxes and the election was cancelled. In all previous elections in Tanzania the emphasis has been on personalities rather than polices. This election might be different. President Karume claims to have done much during his first term. He refers to the Chake Chake Road in Pemba linking Mkoani port with the rest of the towns and villages in the area; improved water supplies; achievement of Millennium Development Goals in education – every child who is at the age of going to school goes to school. Karume has also eased political tensions with the result that international donors have resumed aid. He plans to complete the construction of the Michenzani flats – work stopped during the First Phase Government under his father. CUF, which is a member party of ‘Liberal International’, is proposing some radical new polices, especially in its Zanzibar stronghold. These include privatisation of the clove industry and the other state-run organisations including those concerned with oil, insurance, tourism, together with lots of public housing and the state farms which were established after the 1964 revolution. WHAT WILL HAPPEN THIS TIME IN ZANIBAR? CCM has admitted that holding on to power in Zanzibar is going to be difficult but there is a lot at stake for both parties and it is this factor which creates the political tension for which Zanzibar is renowned. Acccording to Rawlence, CCM is divided about the causes of its woes. Presidents Karume and Mkapa say that the opposition is fuelled by troublemakers who are intent on power at any cost. In recent speeches, they have both called the opposition, ‘people of violence’. They have suggested that CUF is motivated variously by Islamic fundamentalism, Zanzibari nationalist secessionism and foreign intervention from the Gulf States as well as Britain. 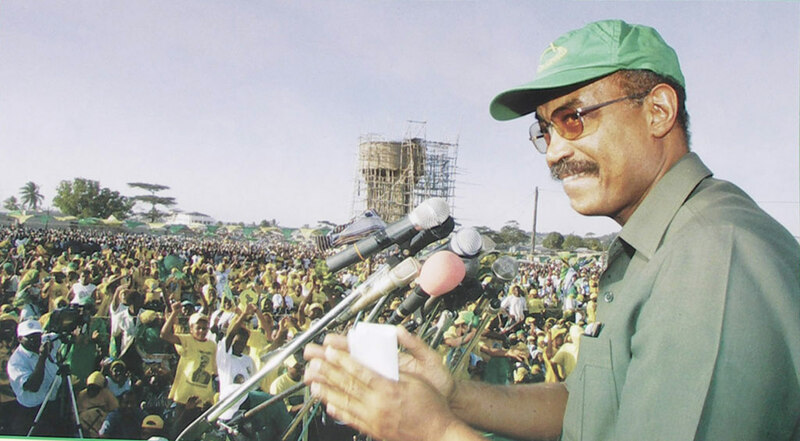 However, according to Dr Mohamed Bilal, former CCM Chief Minister, who recently challenged incumbent President Karume for the 2005 CCM presidential nomination, the President has failed to deliver on CCM’s promises to the people. Bilal was persuaded to withdraw his challenge by President Mkapa at the last minute before the final vote at the National Executive Committee of CCM in Dodoma on 3rd May. Rawlence quotes CUF Zanzibar Presidential candidate, Seif Shariff Hamad, as saying that CCM is guilty of corruption and economic mismanagement; discrimination against people of Arab or Pemban ethnicity; ceding too much sovereignty to the Union government over energy, customs duties, and security; and politicization of the security forces and civil service as well as abuse of human rights. In October 2001, following the violent January riots, CCM and CUF signed a historic agreement, called ‘Muafaka’ (see earlier issues of Tanzanian Affairs – Editor) which provided a framework for ensuring free and fair elections in 2005. Since then a constitutional amendment has been passed, the electoral laws have been reviewed and the Zanzibar Electoral Commission (ZEC) has been overhauled. ZEC has just completed a nationwide computerized registration process to create a permanent voters’ register. However, other Muafaka provisions including a reform of the judiciary have not been implemented according to CUF, the police and security organs are still heavily politicized and compensation promised to the victims of the shootings of January 2001 has not been paid. The Muafaka Committee has started meeting again on a regular basis which is encouraging news. Letter from Alan York: I noted with interest the article on Kilimanjaro and global warming in TA. When a teacher at Tabora Boys’ School in the sixties, I climbed up to the crater and took photographs. On 6th January, 1965, the snow was 5 ft. deep and the ice was awesome. 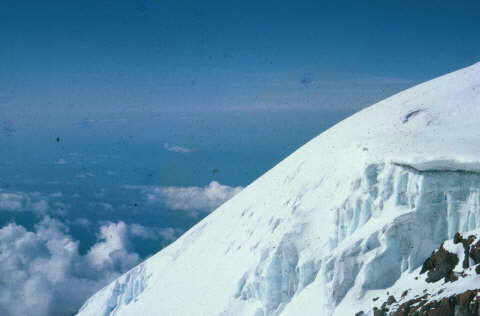 I climbed with David Snook (another teacher at Tabora), and with the East African correspondent of The Times. The latter wrote a description of the climb which later appeared in The Times under the heading ‘Fitness Test for Middle Aged Tourists’! A nominated Member of Parliament, MARGARETH BWANA (49) died of a heart attack in June. She held a Diploma in Social Sciences, which she obtained in the former USSR in 1985, and a Diploma in Economics (1990) from a Bulgarian university. She is the fifth Member of Parliament to die in the past 12 months – Guardian. NICK JAGO (69) was an entomologist and taxonomist whose main research work was on locusts. From 1965 to 1968 he was in Tanzania as a Senior Lecturer in the University of Dar es Salaam. He collected a huge number of insects, many of them new to science and, together with his detailed descriptions and drawings, these remain an invaluable scientific archive. The East African grasshopper (Afrophlaeoba Jago) is named after him. His 100 odd publications include a four-volume pest identification handbook for use in the African field which will be published posthumously – – Thank you John Sankey for sending this item from the Daily Telegraph – Editor. 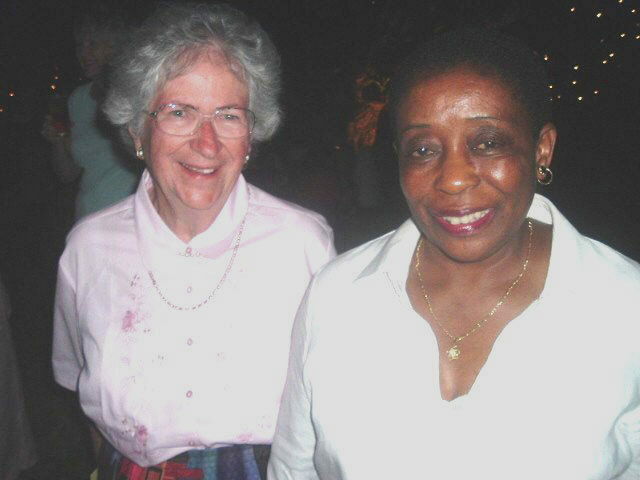 The US First Lady Laura Bush arrived in Dar es Salaam on July 13. She visited the ‘Pastoral Activities and Services for People with Aids, Dar es Salaam Arch Diocese’ (Pasada) in Chang’ombe area where she pledged $500,000 to assist HIV-positive people and their families. Her host, Mama Mkapa, expressed deep appreciation to her for visiting the country to highlight the plight of people infected with Aids. In Zanzibar the First Lady, Shadia Karume, led her to the Al-Rahma Madrasa, about 30km from Zanzibar Stone Town, one of several pre-primary schools that had benefited from $200,000 from USAID. Immediately after the British election in May President Mkapa sent a congratulatory message to Tony Blair. He said that relations between the Labour Party and CCM and between the two governments had been long and rewarding. He went on: The Commission for Africa Report bears the stamp of your genuine concern for Africa. I hope that working together in 2005 may truly be the turning point in engendering a big international push for a strong, peaceful and prosperous Africa. DAR ES SALAAM WATER – WHAT TO DO? On the 13th of May the Government terminated its contract with City Water Services for the management of Dar es Salaam’s water supply. The contract, in which the British firm Biwater was involved, was terminated on the grounds that the firm had failed to deliver services as per the contract. City Water claimed that the original bid documents were misleading and inaccurate. For detailed background see Tanzanian Affairs No. 80. Dr. Brian Mathew looks here at the issues that now face the body – DAWASCO – which has taken over responsibity for water supplies and offers a four-part solution. The problems of Dar es Salaam’s water supply are in many ways similar to problems of urban water supply systems across Africa. Systems installed largely in the 1950’s and 60’s now are not only suffering from under maintenance and old age, but also the challenge of supplying water to populations vastly larger than they were originally set up to serve. The overall figures for Dar es Salaam, a city of 3.5 million people, give an idea of the problem. 281 million litres is pumped into the system every day, while the estimated total demand is 400 million litres per day. Of the 281 million litres that are pumped as little as 16% is delivered to paying customers, the rest is lost to illegal connections and leakages. The solution often adopted by water companies of concentrating, first on cutting off non payers and illegal connections, and secondly installing water meters for those that do have registered and paid for pipe connections, has unseen consequences for the vast majority of the population that have to rely on water vendors, or walking to buy their water. These consequences are economic and social, are of great importance to ordinary people and follow the predicable laws of supply and demand. Where water meters are fitted, for example, the householder with a water connection suddenly becomes much more aware of the cost of the water he or she is receiving and then selling on. The tap owner, if he is to continue supplying water to his neighbours, has to monitor the use of his tap to match its use with income if he is to avoid his water bill going through the roof. As a result he often stops selling water; it is simply too much bother to keep an eye on the tap all day especially if you have a job; it is easier to lock the tap up and refuse water to those who come rather than risk making a loss. The consequences, for the 75+% of the population who depend for their water on informal arrangements such as these is real hardship. With further to travel to find water the price also goes up for both vendors and end users.